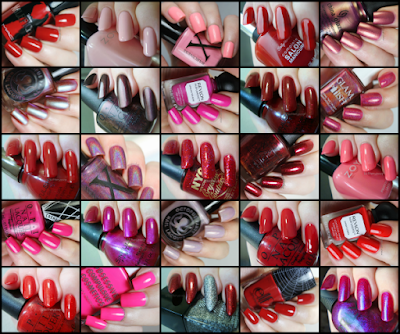 If I could go back in time to the beginning of this blog, I'd have started tagging polish swatches by color. More than a few people have requested it over the years, but it always felt too late to start and/or edit all of the previous post. Instead of doing that, I did something almost as massive and crazy. All this week I'll be posting links to MASSIVE swatch archive pages. I'm not posting the archives directly to the blog, out of respect for mobile readers. Each page will have dozens and dozens of photos. To access the Red/Pink archive page, click here or on the collage below.